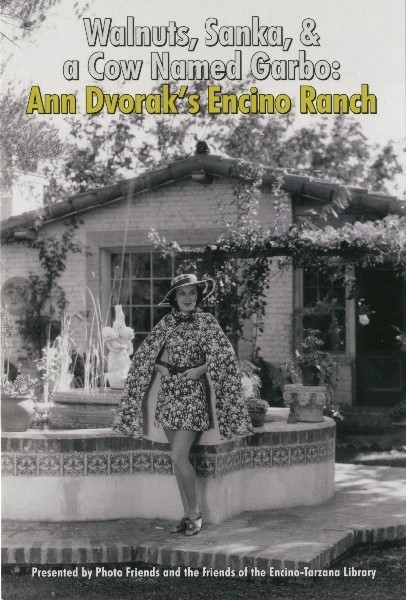 Just a reminder that tomorrow, February 6th, I will be giving a presentation all about Ann Dvorak’s Encino walnut ranch at the Encino-Tarzana branch library at 6pm. I have waxed ecstatic about this property numerous times in the past, which is where Ann resided during the seemingly happiest and most productive time of her life and career. I am thrilled to ramble on about the place for an hour or so to a, hopefully, captivated audience. I have dug up every historic photo I could find, including images of owners after Ann, so the evening should be a lot of fun. AND, Larry Edmunds Bookshop has graciously agreed to sell copies of Ann Dvorak: Hollywood’s Forgotten Rebel at the event. And here we are in the Digital Age…Oh, well, I wish the Library was a bit more “up to date”.. It is currently 1 degree Fahrenheit outdoors and we’re digging ourselves out from under a foot of snow here in this corner of the Midwest part of the USA. Oh, how I would love to be there this evening if there was any way. Well, Central Library is set up to record, but I am doing this presentation at one of the branches. With 72 of them and slim budgets, I don’t see it happening anytime soon. Quite well, thanks! We had around 43 people, which is pretty good for a neighborhood branch. Plus, it was raining, which people in L.A. interpret as a sign of the apocalypse so it’s amazing that many people would be so brave (yeah, we’re weather weaklings out here). Lots of questions – always a good sign of an engaged audience and a couple of book sales. All in all, a moderate success. Next up: A session on TCM! What can we as a group do to help things along with that effort? Wish I could attend one of your signings! I bought your book when it came out & read it in December as I was off from work, recovering from surgery – thoroughly enjoyed it. So well researched & clearly written with love & admiration. Thanks Scott, I really appreciate it! I’ll be introducing a couple of screenings in Chicago in April if that’s more your neck of the woods. nah I’m in Atlanta, but very happy to hear you’ve got more gigs lined up!